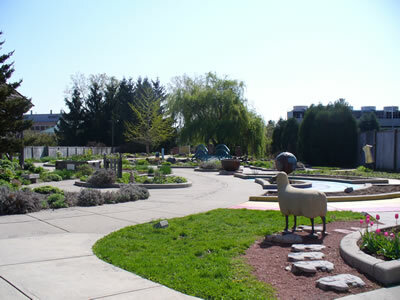 On Sunday morning, Lila, Eva and I visited the 4-H Children’s Garden at MSU. It was a beautiful day, and there were a few other small groups of people strolling around. In the back corner of the garden, obscured by the large tree in this photo, there is a play train. On the other side of the wooden wall, to the right in the photo, there are train tracks. When trains came by, the girls clambered up to the roof of the play train and watched the real trains roar by. The second train only had a dozen or so cars, and it was going very fast. Eva crouched defensively and covered her ears, mouth and eyes open in awe when it finally sped by, horn blaring. this weak I finishedd my Bachealor’s in English frum michigan state university!!!!!!!! While I was a full-time student from 1994 to 1999, I did not complete my degree requirements at that time. I was offered a full-time job in the Web field in mid-1999, and I took it. Although I was close to finishing, that essentially ended my quest for a degree, until late in 2007. I enrolled for a class this past semester (REL350–Buddhism in South East Asia), and handed in my final exam a couple days ago. So, that wraps it up. I expect to receive the diploma soon. I may even frame it. 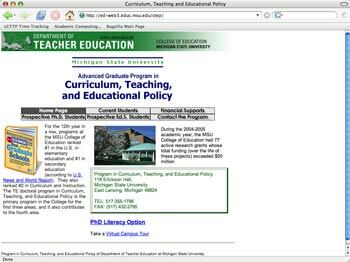 Author Davin GranrothPosted on April 24, 2008 Categories DavinTags education, MSU1 Comment on A degree, finally? Author Davin GranrothPosted on January 9, 2008 Categories DavinTags education, MSULeave a comment on I’m a student again, and tardy already! 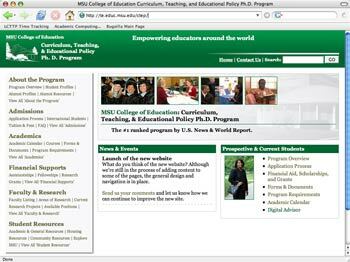 Author Davin GranrothPosted on September 27, 2005 Categories User experience, web, technologyTags information architecture, MSULeave a comment on ANGEL at MSU–Who tossed out the IA? MSU LCTTP called today with an official job offer, which I gladly accepted. I’ll be a full-time instructor in a technology training program at Michigan State University. I start next Monday, June 6th. 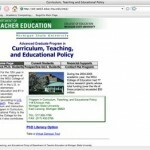 I’ll have about a week to get situated and learn from the other instructors, then I teach my first course on the 13th. The course is Excel 2003, Level 1. I hope–and it sounds like the plan is–that I start teaching more web development-related courses soon. I’m looking forward to this new role, and am thankful that God has made it happen and our family seems to be entering a time of more stability. Author Davin GranrothPosted on June 2, 2005 Categories DavinTags MSU, work1 Comment on A job offer!